Duffel bags make an excellent option for those who want something spacious to carry to the gym. These are travel-ready and multi-purpose bags that are also easy to carry. You can also find multiple compartments in the best gym duffel bag to keep your shoes and other stuff separate. The good thing is, there are plenty of excellent options from some of the top brands like Adidas, Under Armour, and plenty of more. In this article, we have reviewed the three best options out there to make it simpler for you to find the bag you’re looking for. Gym duffel bags are popular among athletes and bodybuilders because they are easy to carry and can hold lots of stuff. Below, you will find three of the best ones that are currently out on the market today. 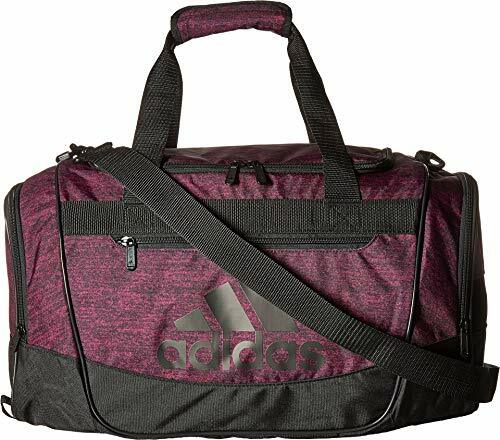 First one on our list is a gym duffel bag from Adidas, which is a company that is one of the leading sportswear manufacturers in the world. This Germany-based brand is the second largest sportswear company after Nike. They are known for their quality products that come in a wide range of options. The Adidas Defender III Duffel Bag is among their most popular gym bags for all the right reasons. For an affordable price, the bag is available in 37 different color combinations, allowing you to choose one according to your liking. The design consists of one spacious and tall main compartment along with two side pockets and one slightly larger front pocket. All the side pockets are zippered so that you can keep your mobile devices safe. For an easy-carry bag, it comes with comfortable haul handles as well as a padded, removable shoulder strap. The thick padding doesn’t add any stress on your shoulders even if you carry it for a long time. This duffel bag is available in three different sizes, which include small, medium, and large. This means that you can easily find a size that fits your needs. The large size comes with dimensions of 29 by 15 by 12 inches. Using 100% polyester, this bag is designed to be breathable. What’s more is that the FreshPak technology keeps the inside of the bag odor-free. This is important for gym bags as you keep a lot of stuff drenched in sweat in these bags. Lastly, the strap is made of a sturdy 3D ripstop material. Because of this awesome selection, the strap is guaranteed to survive even the harshest wear and tear. Under Armour is another well-known global sportswear and footwear brand that is based in the United States. Known for their high-quality and durable products, the Armour Select Duffle is a perfect example of their proud creations. Available in three different color combinations that include black, Moroccan blue, and rapture red, the bag is specifically designed for young boys. However, other age groups can also use this duffle bag without any issue. Like all the other duffle bags, this one also comes with a spacious main compartment assisted with one zippered mesh pocket in the front. There is also one interior drop pocket. The dimensions are comparatively smaller compared to the Adidas Defender III, but that also makes it a more lightweight option. You can carry it with ease using the adjustable shoulder strap or the webbed handles. This duffle bag also comes with a D-ring front clip, which adds an attractive style choice. Overall, it is a comparatively small bag that is perfect for young boys. More often than not, the best gym duffel bag is made of 100% polyester, which is exactly what this bag is crafted from. On the other hand, the handles are made of a soft material to make it easy for you to carry the bag for a long time. Lastly, the zippers are also made of high-quality materials, which guarantee that it will work flawlessly for years to come. As the name reflects, the Giant Kong Gym bag is for those looking for some extra space. The bag comes from King Kong, which is another well-known, U.S.-based brand that exports its gym bags to consumers all over the world. This heavy-duty bag is available in four color combinations that include blue, camo, digital camo, and red. It is designed for weekend travels or for those who want to keep a lot of gym gear along with them. Because it is a huge bag, that also makes it a heavy bag, weighing 3.3 pounds to be exact. The dimensions are 22 x 13.5 x 13 inches, making it the biggest option on our list. It comes with two shoe compartments that allow you to keep two pairs of shoes separate from other stuff. You can also find several pockets at each side of the bag, providing you with enough space to keep stuff in separate pockets. The generous space also makes it a multi-purpose bag that can be used for traveling as well. This bag is made of 1000D military-grade nylon that is also water-resistant, which means that you can also put wet stuff inside the bag without worry that you’ll damage the bag. The material is also breathable and provides enough ventilation to keep it odor-free. In addition, the bag comes with ultra-tough YKK hyper-durable zippers as well as heavy-duty steel bucks to give it not just a more rugged appearance but also enhanced durability. From the duffel bags we just reviewed, which do you think is the one for you? Well, that depends. 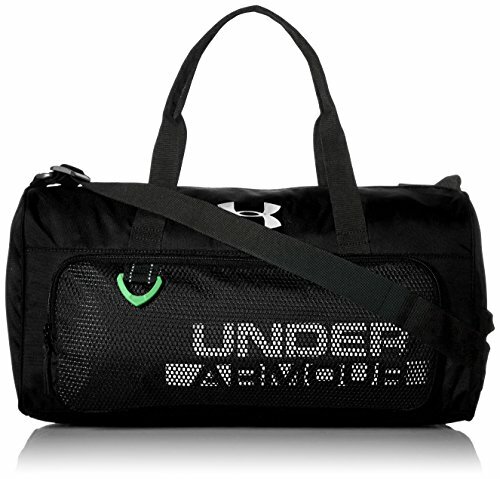 If you are a boy or someone with limited luggage to carry and looking for an affordable, compact, and lightweight option, then the Under Armour bag is best for you. 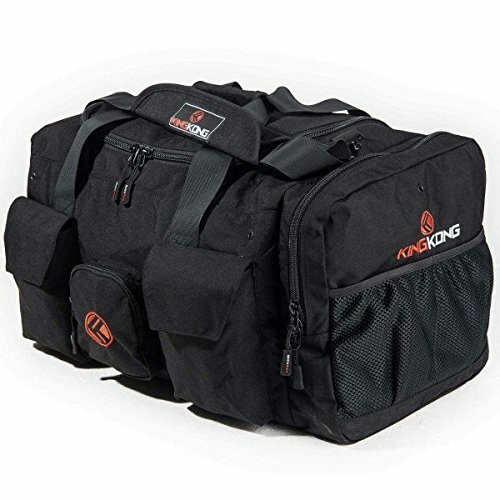 However, for those who want to spend some extra bucks for strength, space, and durability, there are not many options in the market that can beat the King Kong Giant Kong Gym bag. It may be a little expensive than the other options, but its durable built makes it a once-in-a-lifetime investment. Overall, all three comes with different benefits and unique features, so choose one that fits your requirements and preferences. What Are Duffle Bags Used For? How to Measure a Duffel Bag for Carry On? Are Duffle Bags Allowed As Carry On?